Have you got a great French access and infinite English vocabulary? What’s more, you like hanging at a café right here in Zosēni and talking in Spanish to your girlfriend in Denmark? Try a European call pack for 30 min, 60 min or 150 min, and call from Latvia so that the whole of Europe resounds! Now it’s no longer expensive or complicated. 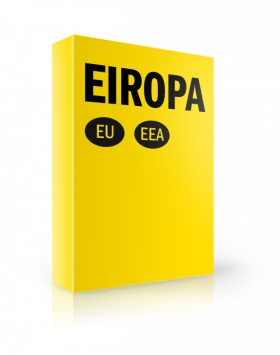 Minutes included in the European call pack are intended for calls from Latvia to the following countries: Austria, Belgium, Bulgaria, Czech Republic, Denmark, France, Greece, Croatia, Estonia, Italy, Ireland, Cyprus, United Kingdom, Lithuania, Luxembourg, Malta, Netherlands, Poland, Portugal, Romania, Slovakia, Slovenia, Finland, Spain, Hungary, Germany, Sweden, Iceland, Lichtenstein and Norway. Call pack is valid for 1 calendar month. Unused minutes are not carried over to the next month. During one calendar month, you can only connect an International Call Pack with one and the same volume just once. If you use up your connected International Call Pack during this calendar month, you can only connect an International Call Pack with a different volume. Connecting the International Call Pack, the subscription charge will be calculated for the current and each subsequent calendar month as long as the service is not disconnected. You can find out how many minutes you have left in your European call pack by self-service by texting “i” to 9911. After using up the pack, call billing rates are set according to the standard price index. When the connected International Call Pack is 90% used up, you will be notified by text message. Pack does not include calls to special charge numbers, special billing directions or these number ranges. Pievērs uzmanību - ja tarifu plānu ZZ VISI esi pieslēdzis līdz 5.12.2019, tad tava tarifu plāna jaunais nosaukums ir ZZ VISI LATVIJA un to vari apskatīt šeit. HOW CAN I CONNECT INTERNATIONAL CALL PACK - EUROPE?